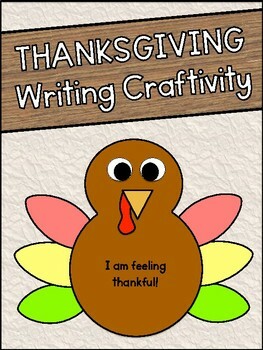 Your students will love creating this thankful turkey craftivity! It combines a bit of arts & crafts with writing that ties in with the holiday! 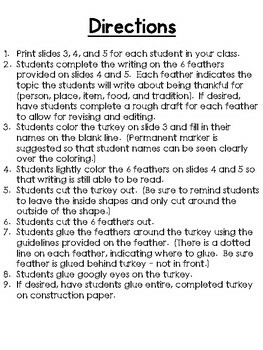 In addition to assembling a turkey, your students will be able to reflect on what they are most thankful for this Thanksgiving. They will write about two people, a place, and item, a food, and a tradition. Therefore, your students will reflect on various parts of their lives they are thankful for - not just the typical "mom and dad" answer. 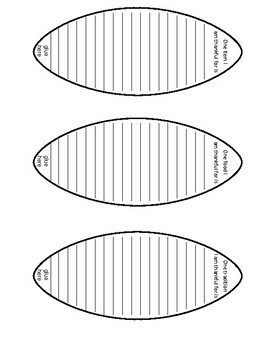 In this product, detailed directions are provided, as well as all of the cutouts you will need to assemble the turkey. You will need googly eyes to complete the craft. However, black construction paper circles will suffice just the same. I hope you and your students have a happy Thanksgiving! Please reach out with any questions you may have regarding this resource. All feedback is GREATLY appreciated! Follow me on TpT, INSTAGRAM, and PINTEREST to get updates on new products and classroom happenings!